These ants can also enter our homes and businesses from outdoors through wherever they want, since they are that small, and especially underneath the siding above the foundation. Caulking/sealing this division/crack can help thwart access. 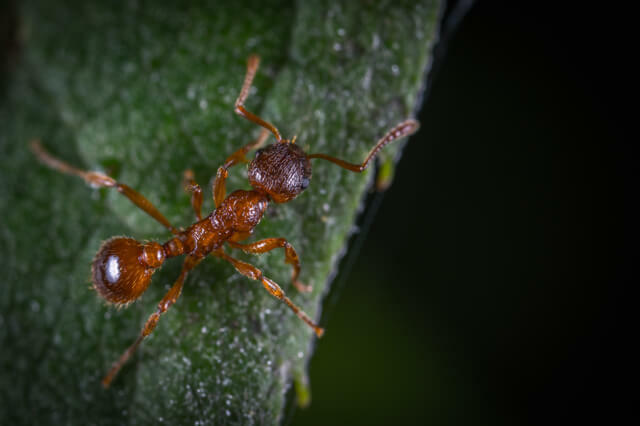 The other most common “small” ants are thatching ants, pavement ants, fire ants, and pharaoh ants. (Carpenter ants are completely different; view any ant or pest on the Click-a-pest page listed alphabetically). Here are some scientific facts about the moisture/cornfield ant: the Latin names are Lasius Niger and Lasius Alienus, respectively. Typical colouring in the Vancouver and Lower Mainland regions is light brown/gold/amber, with variation. The workers (regular, non-winged) all look alike (“monomorphic”) and are 2 to 3mm long. These ants are monogynous, which means singular queen (some ants are polygynous, meaning multiple queens). Favourite foods of these ants are honeydew from aphids/plants, other insects, and people food. Mating and reproduction occur in August-September. The winged ants are the reproductive, called alates. They require rotten wood to nest in, so their presence can indicate wood rot in the structure. Often rotten wood is well underneath the structure, simple replacement is not possible. Treatment against moisture ants is definitely required. Call us at Pest Boss!